In the aftermath of the immediate success of Magic: the Gathering in 1993, a number of other Collectible Card Games (CCG’s) hit the market in an attempt to capitalise on the burgeoning interest in the medium. Up until then there had certainly been card games found in the gaming market, but these tended towards what is known as the Limited Card Game (LCG) model- buy a game, and you get all the game’s cards. It was one of creator Richard Garfield’s enduring contributions to the genre that he crafted a game that drew its inspiration from the sports card market- booster packs that had only a small quantity of the available cards. Clearly, the formula worked. Like any bubble, however, it was inevitably to burst under the volume of games competing for the players’ attentions. Even games with big-name licenses like Star Wars (1995-2001), Star Trek (1994-2007 across two iterations), and Dune (1997-1998) were unable to find sufficient fan support to endure. Long-term success was very much the exception rather than the norm (see: Legend of the Five Rings). In this Darwinistic struggle for market share, second chances are virtually nonexistent. In 2004, the Wizards of the Coast co-produced Duel Masters released to the English-speaking market. In many ways a simplified version of Magic: the Gathering, its design team boasted impressive Magic alumni like Charlie Catino (part of Alpha’s playtest group with Garfield, and co-designer of Mirage and Visions) and Mike Elliot (lead designer on sets like Urza’s Saga and Nemesis). It had already been a runaway hit in Japan since its release in 2002, and hopes were high that it could find a place in the domestic market. Though it was a moderate cross-platform success (including no less than four different video game translations for Nintendo and Sony platforms), however, sales were weaker than hoped for and in 2006, the English-market game was quietly discontinued. As it happens, though, the Duel Masters story does not end here- the franchise has been given a second lease on life. 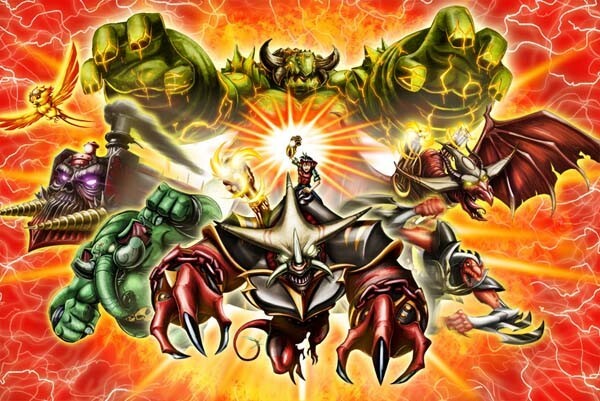 Reglossed as Kaijudo, Duel Masters is back with a rebooted card game on the back of a Saturday morning cartoon. Over the course of Ertai’s Lament, we’ve experienced some significant growth in our approach to gaming. Like many players, much of our gaming career has been spent exclusively faithful to Magic: the Gathering. That said, there is a small subset of players who regard themselves as gamers first, and who explore what the medium has to offer with greater enthusiasm. Although our passion for Magic precons has in no way diminished, we’ve begun to occasionally branch out into other games and see what they have to offer. Kaijudo is one such game, and because of the parallels with Magic there has been some interest from the Magic-playing community (our friends at Goblin Artisans, for instance). True to form, we’ll be reviewing the new Kaijudo precon decks, though Magic purists may be at ease- non-MTG reviews will run on our “off days” and won’t interrupt the regular schedule of Magic content. Before we jump into our reviews, however, some groundwork needs to be laid. Just as we did as players, we’ll be approaching the game through the prism of Magic and explaining its fundamentals. A game of Kaijudo is not fundamentally different than a game of Magic, but it has a number of small twists. First, your opening hand size is five cards, not seven, but just as in Magic the “on the play” player who goes first skips their first draw. Kaijudo also has no maximum hand size, so players are free to accumulate as many cards as they see fit. Just as in Magic, a game of Kaijudo involves two players attacking each other with creatures and casting spells one each other and the battlefield. However, unlike Magic, there is no life total to whittle down. Instead, each player begins the game with the top five cards of their library turned face-down in front of them. These are called “shields,” and a player loses the game when a creature of any size attacks them when they have lost all their shields. Consequently, the focus of the game is to disable your opponents’ shields, then deliver a killing blow. Here’s one interesting twist: when your opponent knocks out one of your shields, you get to put that card into your hand- essentially, a free draw. This means that the more you damage your opponent, the harder they will be to kill as they’ll get card advantage, making an intriguing balance. Some cards have a shield blast ability, which is not unlike the miracle mechanic from Avacyn Restored. If your opponent destroys one of your shields and it has the shield blast keyword on it, you reveal it for an immediate bonus effect! The Untap phase is identical to Magic, as both games use the same tap/untap mechanism to indicate ‘actions’ of cards. After resetting your board, you then get to Draw a new card. Charge Mana has an unfamiliar ring to it, but it really just means to “play a land.” Well, except for one little niggling detail… there are no lands. Wait, no lands? Unlike Magic, there are no dedicated mana-producing cards in Kaijudo. Instead, each turn you are allowed to take one card from your hand and play it in your “Mana Zone” face-up. Whatever it might have been- a creature or spell- is forever gone; now, you simply have a “land” that taps for one mana of the colour of the card. Summon & Cast is what we’d call your “main phase.” Unlike Magic, however, you only get one, and it’s before combat. This keeps things simple and straightforward. Like Magic, you need to pay a certain amount of mana to play a card. In Magic, there’s much more variety in summoning costs. Consider the following Magic mana costs: , , and . In all three cases, you need two mana, but for us they mean very different things. The first one, , is clearly an artifact of some kind, since it requires no particular colour to play. The second cost, , tells us that we need to be playing Blue, but since it only needs one blue mana, this is something we can “splash” in a deck with other colours. That last cost, however, is full-on Blue. This is much harder to justify in a deck unless we’re playing with a significant amount of Islands. In Kaijudo, spells and creatures also have a colour, but you only ever need one of that colour to cast it. Let’s bring out an example, the mighty Gatling Skyterror. Beginning in the upper-left corner and working our way around the card clockwise, as in Magic we find a great deal of information. First, the casting cost of this beastie is three mana. Since we see the Fire symbol there as well, we know that at least one of the mana have to be Fire. 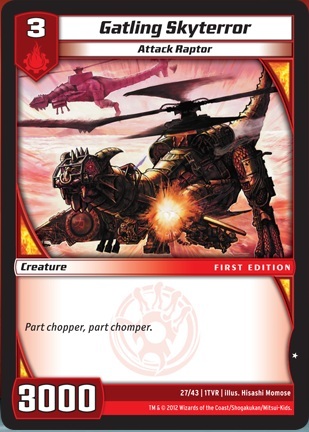 In Magic terms, the casting cost of the Gatling Skyterror would be: . As with Magic, there are five different colours in Kaijudo, called civilizations, but we’ll be diving more deeply into those in our next Kaijudo article. So what are we getting for our precious three mana? Well, moving to our right we see the creature’s type/subtypes just below the name, in this case “Attack Raptor.” This is occasionally relevant, just as “Goblin Shaman” or “Human Soldier” might be. Next we find the set indicator, “First Edition.” This fills the same role as the expansion symbol does in Magic. What it does not do, however, is denote rarity. See that star a little further down on the right-hand margin? That’s how you can tell the commonality of a Kaijudo card. Whereas Magic has four rarity levels (common, uncommon, rare, and mythic rare), Kaijudo has five (common, uncommon, rare, very rare, and super rare). Since our Gatling Skyterror has one star, we know it to be a common. Of note: very rare and super rare cards are all foils, with super rares getting a high-grade foiling treatment right down to the frame. So far, we’ve essentially been looking at “Magic Lite,” but brace yourselves- things are about to get quite a bit different from here on out. As we continue our clockwise tour of the Skyterror, we can’t miss the big, bold number staring at us from the lower-left corner. If you guesses that 3000 corresponds in some way to Magic’s power/toughness metric, you’re absolutely right. To a planeswalker’s sight, this would essentially be a 3/3 creature- not a bad deal for Red! That said, remembering that Kaijudo deals in shields rather than life totals, it should come as little surprise that the concept of damage doesn’t exist here. If a 3000 creature and a 5000 creature clash, the 5000 creature doesn’t limp away with only 2000 “health” left (leaving it vulnerable to some sort of burn-spell equivalent of a Shock). It simply eats the 3000 creature, belches, and walks away. Our friend above being what you’d call a “vanilla creature,” its text box only contains a scrap of flavour text. Other creatures, however, will have special abilities listed here, such as the shield blast ability mentioned above. Continuing up the left side of the frame, we then see the card type- “creature.” While Magic has a wealth of card types (see: Tarmogoyf), Kaijudo contents itself with only two: creature and spell. Easy, right? What can be a little less easy, however, is the next phase of the game: Attack. In Magic, combat is presented as a single wave. You announce which of your creatures are attacking (and if there are planeswalkers in play, who they are attacking). Your opponent then has the opportunity to respond with a defense. Once that’s done, damage is assigned and combat is more or less concluded. Kaijudo is quite different. Rather than declare all of your attackers, combat here is one at a time. You announce an attacker, then resolve the attack. Repeat until you either run out of attackers, or decide to end your attack phase. Remember, since we’ve passed the Summon & Cast phase, you can’t impact battle with spells in between attacks. That isn’t to say that combat is without its intricacies. For one thing, your attacking creature has a couple of options on the attack. You can go after your opponent’s shields, of course, but you can instead attack any of your opponent’s tapped creatures. This is where the “damage isn’t cumulative” thing is important to remember- you can’t kill your opponent’s tapped 5000 critter by attacking it twice in a turn with two 3000’s. Instead, that’s just two snacks that your opponent’s 5000 critter gets to munch on. When you attack an opponent’s shields, if your opponent cannot block the attack then they lose one shield (two, if your creature happens to have the shield breaker keyword). As mentioned above, this becomes a free card for them, going into their hand (or being played immediately if it has a shield blast effect). Here’s something else to bear in mind: your opponent can’t block just because they want to. In Magic, every untapped creature is a potential defender. In Kaijudo, being able to defend from an incoming attack is a special ability, called blocker. This ability lets a creature with blocker tap to intercept an incoming attack, regardless of who or what was being initially targeted. So in summary, you declare your attacks one at a time, and they fully resolve before you move on to the next attacker. Once you’re finished attacking, you End Turn and pass to your opponent, who then begins their turn by untapping everything. And so on it goes until one player or the other wins the game. Now that we’ve explored the major points of Kaijudo, we’ll conclude with a brief look at the state of the game. The first major release of the game is coming up this Autumn, and will bring with it two different precon decks, Sonic Blast and Rocket Storm. 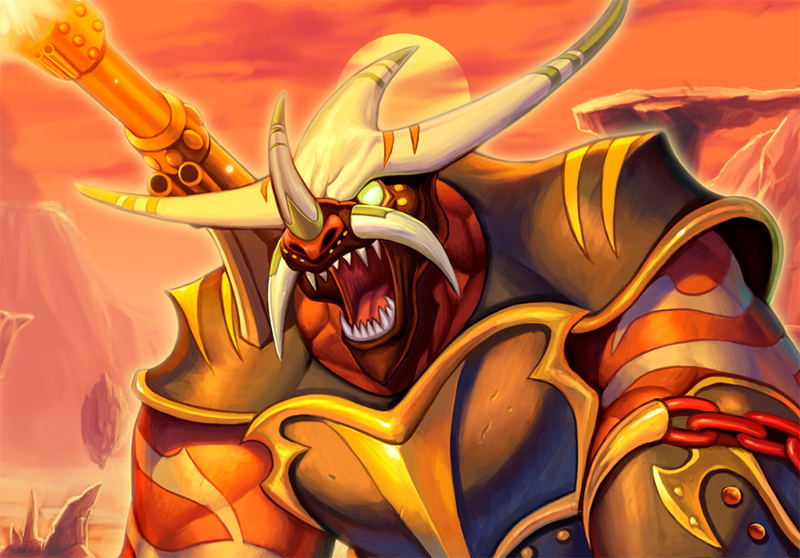 In the meantime, to ensure that there was some product availability with the launch of the cartoon, Wizards has released a limited “Dojo Edition” expansion along with a single precon, Bull Rush. Additionally, there’s a precon release in the “Duel Deck” format, the Battle Decks: Tatsurion vs Razorkinder, which we’ll be reviewing next. Just as I would (and do!) the vice versa,I do advise Mtg players to give it a shot if they have a chance to play, as you see mana/advantage in a whole new light. While I do see this type of article commonly (and have debated similarities/differences way too many times) this was good, and waiting to see what you say on the decks, while the rest of us eagerly await more. Duel Masters had it all. TCG, anime, manga. Even this new spin has an anime series. Oh man! I’m so excited! I don’t play this game (yet) but I’m really happy to see you guys doing something on your “off” days. In my experience, YGO decks (which I prefer to call Duel Monsters) have a similar ratio as MTG, save you don’t have lands. 1/3 to half creatures. Rest non-creatures. Though it had the problem of way too many general “staples.” That’s why I feel in love with Magic. I can run 10 different decks without having to much crossover. Duel Monsters it was hard too. Had to have your Mystical Space Typhoon and such. Starting to miss playing my Blue Eyes deck where people ran into my Needle Worm and went “WTH!” over and over. I don’t know, this seems a little too much. I, along with other players I’m certain, don’t only play Magic because they dont like other games, but because they can’t afford to play more than one game and Magic holds a special place in their hearts and minds. I hope that for the majority of players on the site (especially the 58% that voted not to review other card games) that the Magic part of the site does not suffer. These players are here for Magic reviews and advice foremost, and and taking the focus off what most people on the site came to it for could potentially ruin the site. I’m happy as long as Magic is still the premiere game on the site, and the reviews do not have to wait for those of KaIjudo. I may not be on this site often, but I doubt they are suddenly switching, they noted themselves that its only done on an “offnight”. Compared to mtg…a lot of games look cheap, but this really is. I’m glad someone raised this concern in the comments so I can more casually address it rather than in the piece. For as long as EL has been running, we’ve had a very defined schedule: a new Magic deck review every 48 hours. Note the wording- a “new Magic deck review,” because that’s key, as I’ll come back to it in a moment. What that means, though, is that on the “odd” or “off” days as we call them, EL typically has no content. Review, dead air, review, dead air, and on the cycle goes. On occasion, we’ve created content that is Magic related, but doesn’t quality as a “review.” We’re so dedicated to our review cycle, that rather than put these non-review pieces into the regular publishing schedule, we run them on “off days” as, essentially, ‘bonus content.’ Examples of this include Ertai’s Meddlings, Whispers of the Muses, and the highly popular Championships twice a year. As it happens, as players we’re enjoying branching out. Wizards’ PR firm, with whom we have a fantastic relationship, approached us about Kaijudo, and we thought hey, why not? We’re also keen to get into some of the WoW TCG decks. That’s one benefit about precons- if you limit yourself to them, they do keep the games relatively affordable. But if you note when the Kaijudo piece was run, you’ll see it fell on an “off day.” They all will. TLDR: EL first and foremost is a review site for the precon decks of Magic: the Gathering. That’s what got us this far, and that’s the core vision we’ll always hold to. When we run non-review content, whether it be for MtG or other games, it will be on the “off days,” so we’ll continue to hit our goal of a new MtG review article every other day. Thanks again for raising this. I know youre not alone in your concern, and I love to see the passion for the Magic content! I played Duel Masters some time ago. I really liked the shield mechanic, often taking a blow could get you a card that would turn the tables. The thing i didn’t like from that game was the innability to block if your creatures lacked the “block” keyword. They were often vital, and the black civilization, for example, had few blockers. Great article! I should point out, however, that unlike in Duel Masters, where you were required to tap a same-civilization card in your mana zone to play a card, in Kaijudo you just have to have a card of a given civ in your mana zone to “unlock” it. For instance, you could play 2 fire cards that cost 2 mana each even if you have 3 nature cards and only 1 fire card in your mana zone because that 1 fire card “unlocks” the fire civilization for you. Makes it a whole lot easier to splash colors! Keep up the neat articles, Ertaislament! The game is brilliantly designed, though, and very balanced thus far. The only issue I foresee is that mana is overly stabilized, in that you only need the ONE of the same color. It’s almost TOO easy to bust out cards, but I foresee it being toned down if it becomes a problem. I do wonder if the game will go onto set rotation, though! That said, I share your concerns with the mana, it does at times seem almost too easy, especially after we were advised you only need to have access to the colour in your mana zone to play it, regardless of how many you might need (a la Magic). Just a tip. You only need to have a card in your mana zone that is the color of the card you are casting. You do not need to actually use that card to cast the spell. If I have 1 green card and 3 red cards in my mana zone, and I want to cast a red creature that costs 3, I may pay with 3 green cards. Quillspike tatsurion is basically useless if you can bypass him , even if untapped, and go straight to my shields. ?